Nowadays, most of people are using sensor technologies on their daily lives because most of common-off-the-shelf phones have at least accelerometer, gyroscope, geo-magnetic sensors with bunch of location-related 'network' sensors including GPS, WiFi, and Bluetooth chipsets. They have been used for various applications and now, they are moving to another devices. Computer scientists have more noble(?) words to mention those devices as: off-device sensors. In this post, I will try to cover most known sensor devices and their extensions. Also, I will describe what could be the future direction of the convergence of sensor devices with existing goods. 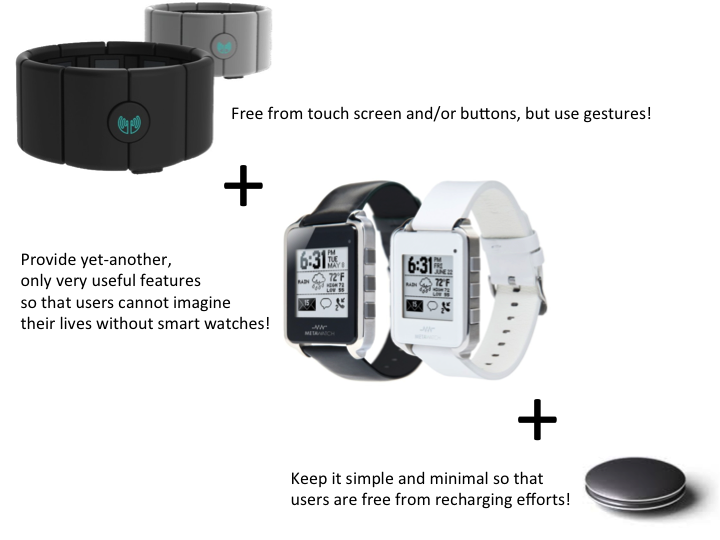 First of all, let's start with the easiest one, Smart (or, Programmable) Watches. Previously, Dan Eisenreich made a great comparisons among Watches with programmable APIs. This table is basically from his summary, and I added a few more relevant items with more context based on the other sources. As we can see on the above, there are few differences on the form factor (screen size), but the adopted configurations of sensors show significant differences among them. I have to say that I just forgot to attach some numbers of sold products, but there is no prominent winner on the smarter watches, and this could be a reason why each vendor is trying in a different way (probably trying a differentiation with the rest). Be honest, I don't think that we have enough values on their smart watches, because the watches should be recharged every few days (or, even everyday for Sony's, Motorola's and ImWatch's one), and there are less meaningful tasks by sacrificing such an inconvenience of limited battery power. The smart watches shouldn't get warmer (or hotter) than human body temperature. Otherwise, people will mad due to the heat on their wrist. The smart watches should be able to provide at least a new 'killer' use case so that a mobile phone and a watch can make a synergic effect. 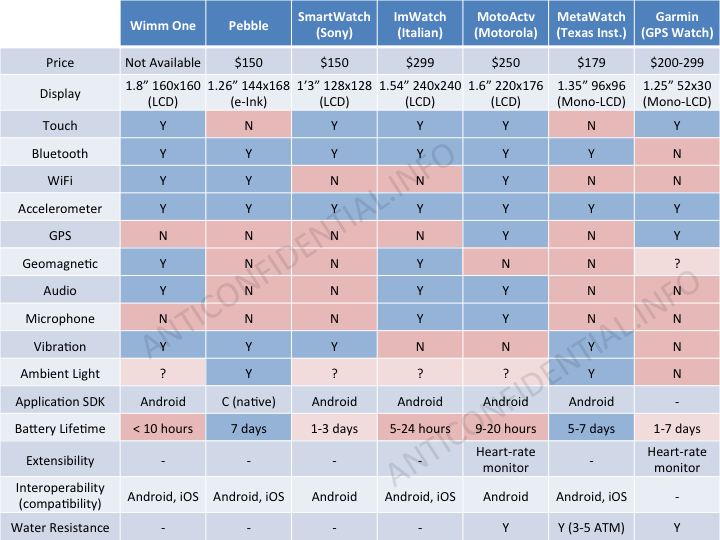 Note that, providing the same or similar use cases and applications on the wrist watches is not a clever way to go. Also, we still have the battery power limitation, so it should not make users annoying due to recharging everyday. IMHO, the above challenges are quite hard to achieve, so this could be the major reason why we're still not having any 'cool' smart watches from high-end manufacturers including Apple, Google, and Samsung. I guess (with 80% confidence) that the three of them have on-going development project internally, and their products may come out in 12 months from now. Secondly, let's focus on a new kind of sensor utilities for better lives. 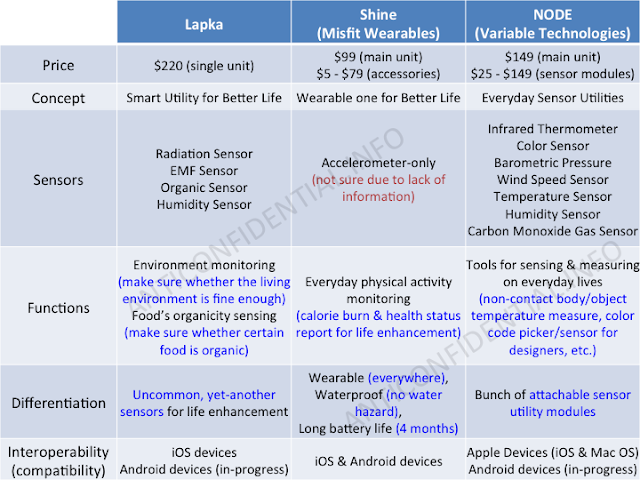 Recently, various kinds of sensor utilities (or, rather it may be called as 'off-device sensors'?) have become available by various startup companies. If you are interested in the common-off-the-shelf sensor devices, please visit any Apple Stores, then you will see bunch of wearable devices compatible with iOS devices. 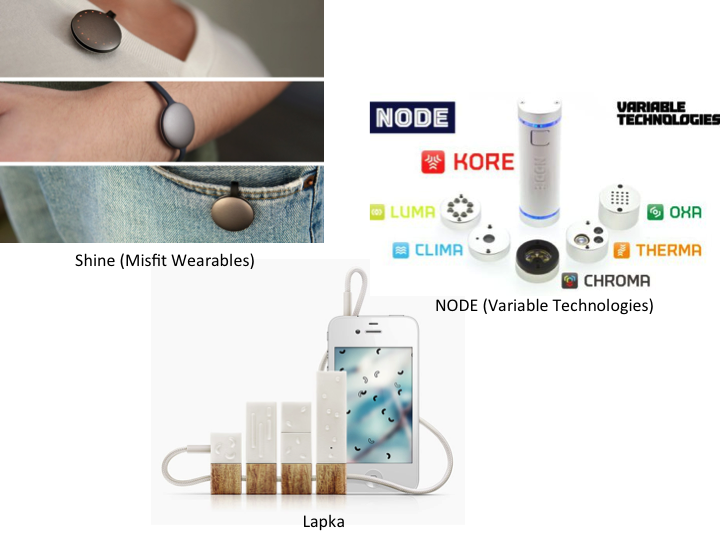 But, here, I would like to introduce three startups' devices with more extraordinary characteristics; Lapka, Misfit Wearables - Shine, and Variable Technologies - NODE. 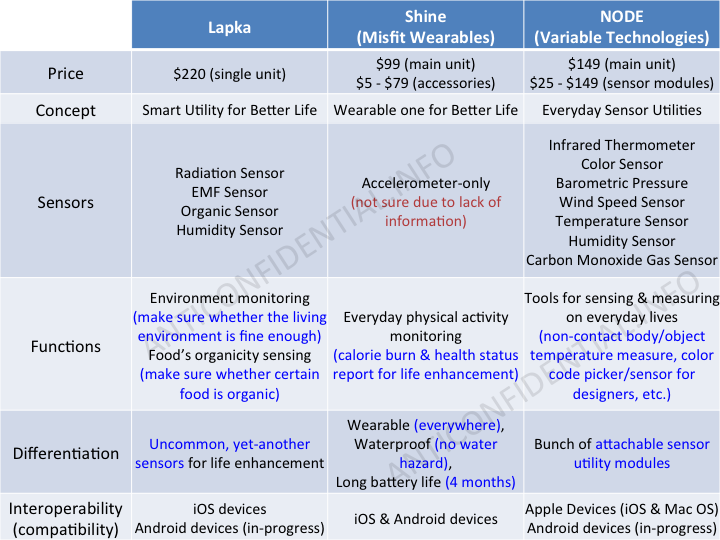 Each of them (Lapka, Shine, NODE) have non-overlapping characteristics, because their roles and objectives as sensor utilities are quite different each other. The most interesting one for each item is as follows; 1) Lapka provides yet-another sensor called, 'organic sensor', even though we're not sure whether it really works great with existing food; 2) Shine works for 4 months without charging any battery, and it is waterproof by default; 3) NODE provides bunch of necessary utilities for daily lives. Note that, Shine's internal sensors are not 100% known, since the engineers on that team haven't confirm any information of used sensors. But I strongly believe that they may have only the accelerometer, with single pair of microphone and speaker (update: this might be wrong, because there is still another cheaper, but slower way to communicate: capacitive touch communication - using capacitive electrical resistance signal to touch sensor on the mobile screen) so that Shine can communicate with a mobile phone. Last but not least, I would like to introduce a new trial (not really new in the electrical engineering field) of using the EMG(electromyography) sensors for human gesture recognition. The startup called Thalmic Labs announced their new product called MYO, which works with ~10 EMG sensors attached at the arm-band like wearable device. The price is not so high, just $149 per device. FYI, we have found various prior research efforts during 2008~2011. The most well-known work is a project called MuCI (Muscle Computer Interfaces) at Microsoft Research. They have worked on both training and activity recognition based on the EMG sensors, and they were able to sense any single movement of the five fingers with certain amount of probability (please refer to their papers, thanks). 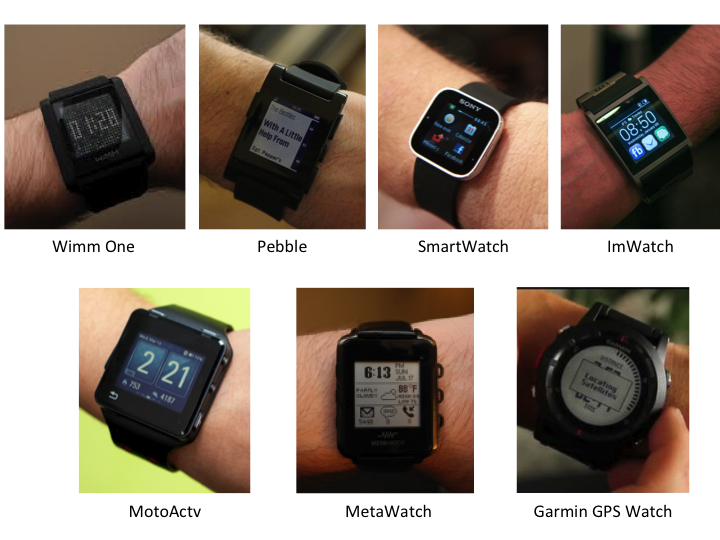 From the first 7 examples (wrist watches), we have seen bunch of different ways to implement the smart watches, with various sensors, display, and connectivity mechanisms. We also learned that some features and techs (e.g., mostly the watches with color LCD with backlight, WiFi communication) may spoil the battery lifetime. But Shine taught us that single device can run 4 month without recharging any batteries when we can minimize the features and functionalities of a device. Finally, Thalmic Labs (MYO) presented how high-technologies can be adopted to the end-users. So, my conclusion (rather a suggestion to the tentative manufacturers) is to do a 'selection and concentration' for the target consumer devices. First, smart watches should avoid having any backlight-based displays (but more energy-efficient e-inks) since it spoil battery lifetime, and minimize the use of the wireless communication, since it costs several order of magnitude more than just inter-process communications in a local device. Some possible way to communicate is, using NFC, or using mic and speaker with very little amount of communication, then it can be more energy-efficient. It would be also great if smart watches can get a few electromyography sensors on their wrist band, so that the watch can just understand the user's gesture, then there will be less requirement to have some touch screen on top of the display panel. Hope we have smarter utilities in the near future, and please feel free to make any objections or counter thoughts on this post. Thank you for your time to read this poor post, and thank you in advance to receive any of your feedback!